fine-grained durational distinctions, which go beyond mere binary short vs. long distinctions. and [obasaN] “aunt” vs. [obaasaN] “grandmother” in Japanese. yond the familiar short/long binary distinction2. rent project examines, see Maekawa (1998). that may possibly accompany the lengthening pattern. vowels (Hirata & Tsukuda, 2009). quences of the same vowels across morphemes in Japanese (e.g. a wider range of vowels in Japanese. which commonly appear stem-finally in Japanese adjectives4. sentence: e.g. [çiza-ɡa ita-i] “(I have) a knee pain”5. 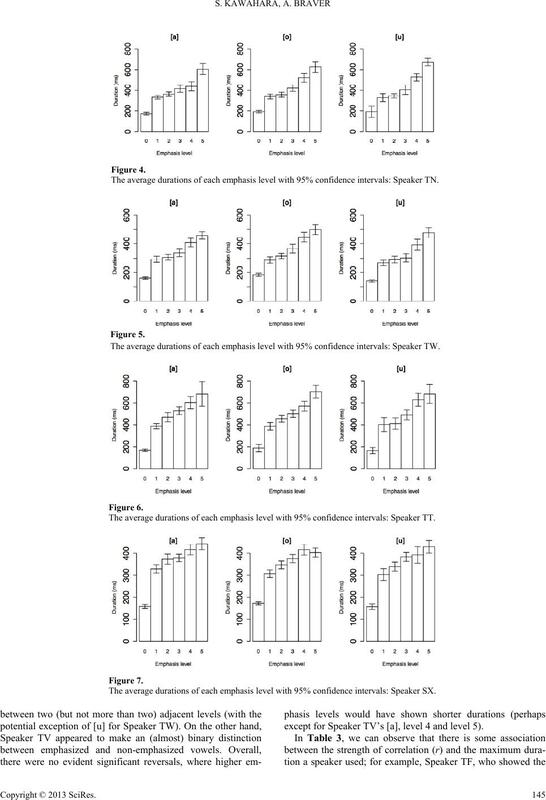 of emphasis were included as stimuli, as illustrated in Table 2. An illustration of one stimulus set in Japanese orthography. speakers were allowed to take a short break after each block. ker was assigned 30 minutes for the experiment. tor the progress of the recording. some exceptions (e.g. [samiɕi-i] “lonely”). of emphasis for this speaker, and error bars do not overlap. of emphasis, there is a shorter, but steady, increase in duration. durational increase and emphasis level is very strong. ration for each condition differs, and error bars barely overlap. (t(245) = 20.2, p < .001), and the correlation estimate r is .79. Sample spectrograms: no emphasis, emphasis level 1, emphasis level 2. The average durations of each emphasis level with 95% confidence intervals: Speaker TF. The average durations of each emphasis level with 95% confidence intervals: Speaker TX. < .001), and the correlation coefficient r is .81.
sented in the size of the error bars for these conditions); e.g. ms (t(242) = 13.8, p < .001). reach statistical significance (t(245) = 7.2, p < .001). way durational distinction, without much overlap in error bars. The average durations of each emphasis level with 95% confidence intervals: Speaker TN. The average durations of each emphasis level with 95% confidence intervals: Speaker TW. The average durations of each emphasis level with 95% confidence intervals: Speaker TT. The average durations of each emphasis level with 95% confidence intervals: Speaker SX. except for Speaker TV’s [a], level 4 and level 5). 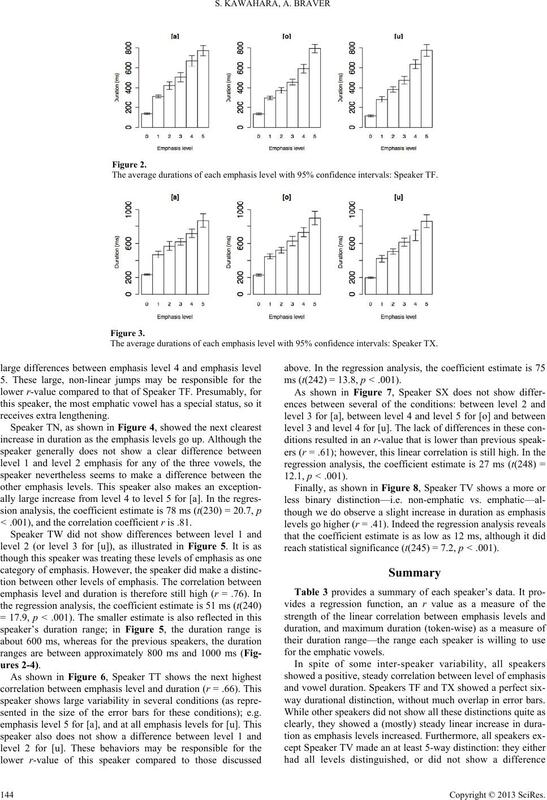 The average durations of each emphasis level with 95% confidence intervals: Speaker TV. Summary of each speaker’s behavior. speaker has the third-lowest r-value. ticipated in Kawahara (2012b) do not overlap). to potentially make six-way durational distinctions. range of possible contrasts that the grammar can deploy (see e.g. cal imperatives on perceptual dispersion in durational contrasts). 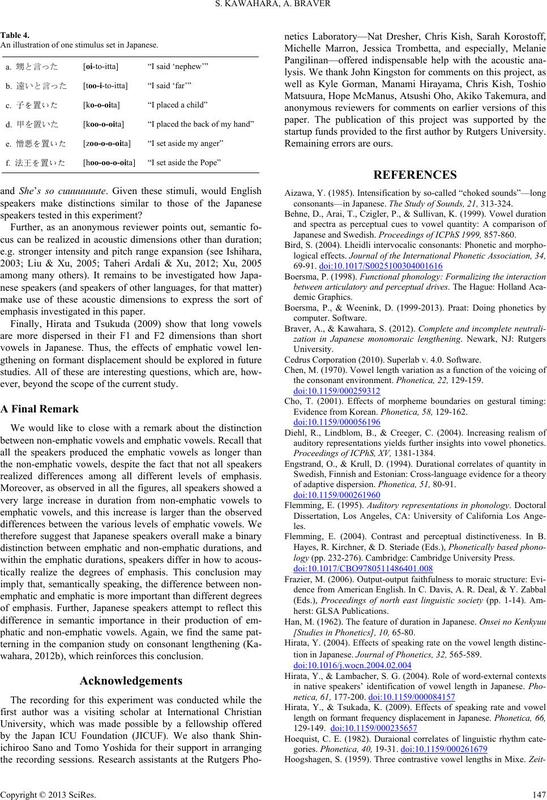 nation, see the companion paper (Kawahara, 2012b). listeners be able to track these different degrees of emphasis? durational manifestations of vowels is question worth pursuing. question (although this paradigm does not control for accent). An illustration of one stimulus set in Japanese. speakers tested in this experiment? emphasis investigated in this paper. ever, beyond the scope of the current study. realized differences among all different levels of emphasis. wahara, 2012b), which reinforces this conclusion. startup funds provided to the first author by Rutgers University. consonants—in Japanese. The Study of Sounds, 21, 313-324. Japanese and Swedish. Proceedings of ICPhS 1999, 857-860. Cedrus Corporation (2010). Superlab v. 4.0. Software. the consonant environment. P honetica, 22, 129-159. Evidence from Korean. 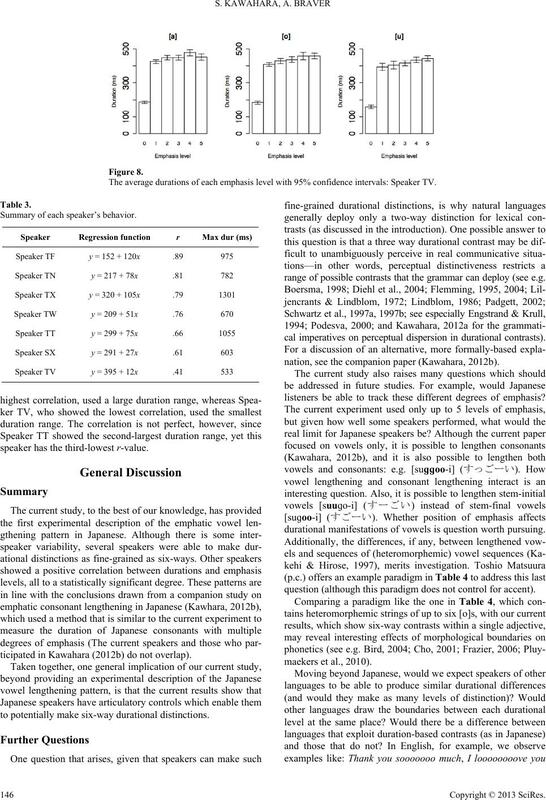 Phonetica, 5 8, 129-162.
auditory representations yields further insights into vowel phonetics. Proceedings of ICPhS, XV, 1381-1384.
of adaptive dispersion. Phonetica, 51, 80-91. Flemming, E. (2004). Contrast and perceptual distinctiveness. In B.
logy (pp. 232-276). Cambridge: Cambridge University Press. [Studies in Phonetics ], 10, 65-80.
tion in Japanese. Journal of Phonetics, 32, 565-589. 9th Annual Workshop on Native American Language. suu chikaku-no kentou [Constructive study on mora identification]. Onsei Kenkyuu [Journal of the Phonetic Society of Japan], 1, 23-28.
spondence. BA Thesis, Tokyo: International Christian University. bility scale: The case of [+voice] in Japanese. Language, 82, 536-574. Japanese. Newark, NJ: Rutgers University. A wug-test with auditory stimuli. Language sciences. before voiced and voiceless consonants: An auditory explanation. 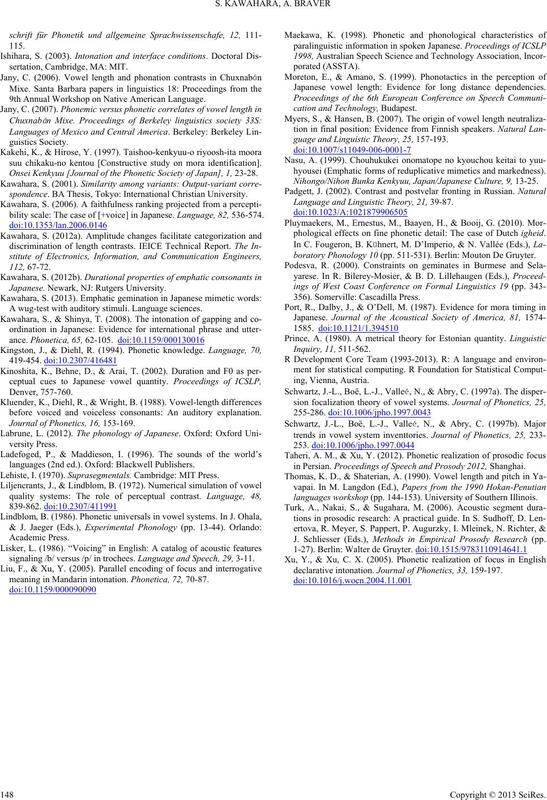 Journal of Phonetics, 16, 153-169.
languages (2nd ed.). Oxford: Blackwell Publishers. Lehiste, I. (1970). Suprasegmentals. Cambridge: MIT Press. signaling /b/ versus /p/ in trochees. Language and Speech, 2 9, 3-11.
meaning in Mandarin intonation. Phonetica, 72, 70-87. 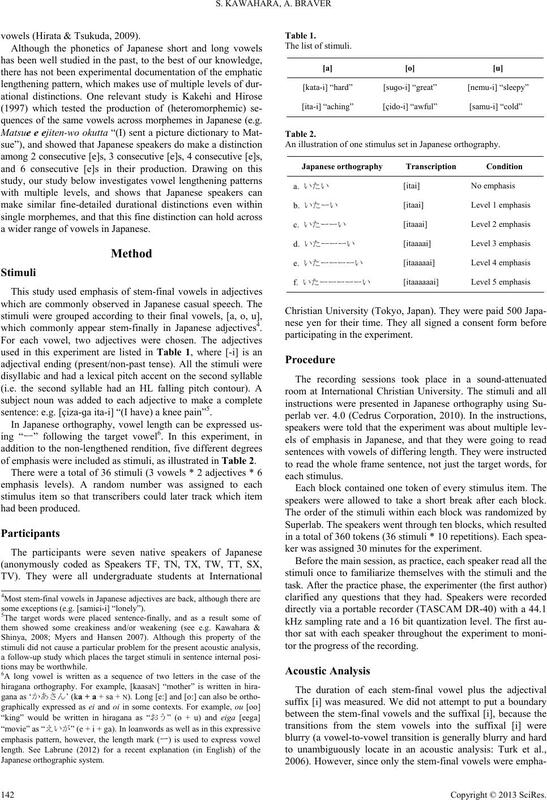 Japanese vowel length: Evidence for long distance dependencies. 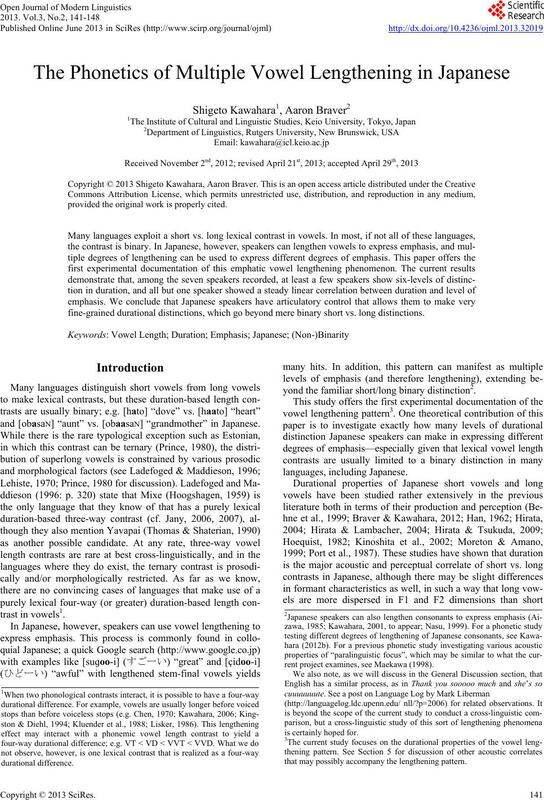 guage and Linguistic Theory, 25, 157-193.
hyousei (Emphatic forms of reduplicative mimetics and markedness). Nihongo/Nihon Bunka Kenkyuu, Japan/Japanese Culture, 9, 13-25. Language and Linguistic Theory, 21, 39-87.
phological effects on fine phonetic detail: The case of Dutch igheid. boratory Phonolog y 10 (pp. 511-531). Berlin: Mouton De Gruyter. in Persian. Proceedings of Speech and Prosody 2012, Shanghai. languages workshop (pp. 144-153). University of Southern Illinois. J. Schliesser (Eds. ), Methods in Empirical Prosody Research (pp. declarative intonation. 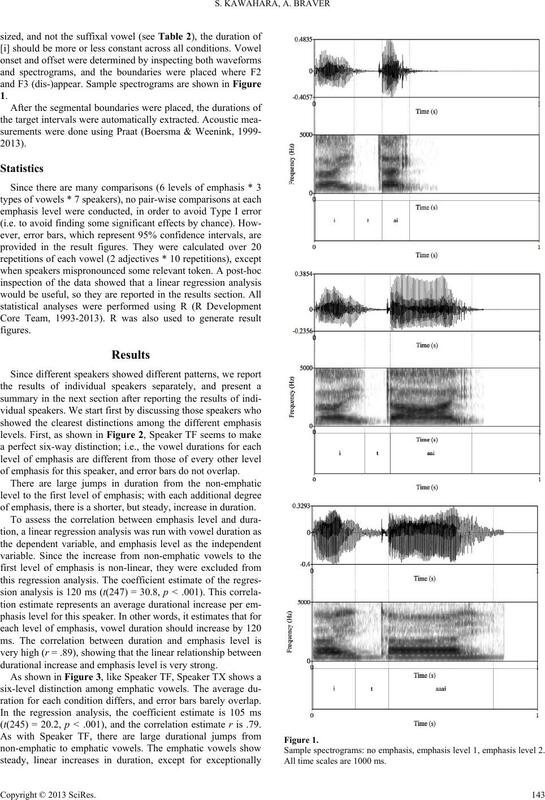 Journal of Phonetics, 33, 159-197.